What will happen to Ireland’s abortion rate after repeal? In May, Irish voters backed a proposal to amend a constitutional provision which placed a ban on abortion in most cases. But what impact is the referendum result likely to have on the Irish abortion rate in the coming years? Eoin Flaherty explains that the circumstances which drive marriage, divorce, and abortion rates are complex and are not susceptible to short-term changes in social policy. As such, it is too simplistic to assume that a change in the law will necessarily result in a direct increase in the number of abortions being carried out. Before going to the polls on 25 May, those opposed to liberalising Ireland’s abortion laws claimed the results of a successful repeal would be dire. One report on likely future scenarios from the ‘LoveBoth’ campaign, predicted an extra 5,300 abortions per year post-repeal. Due to its constitutional prohibition on abortion, Ireland does not keep reliable data on those who travel to procedure terminations, but of those who do, we are certain the majority travel to the UK. In 2017, a total of 3,092 terminations were procured by Irish women, constituting 64% of all terminations sought in England and Wales by non-residents. Those opposed to repeal suggested retention of Ireland’s abortion laws would have a restrictive effect on rates – or that a harsher regime would save unborn lives. The evidence for this claim is thin, yet it is a common mode of thought that has appeared in the recent past. During the 1995 divorce, and 2015 marriage equality referendums, predictions were made with similar certainty by those opposed to change. In 1995, the conservative slogan read ‘Hello Divorce, Goodbye Daddy’, as those opposed to legalisation predicted a surge in men deserting their spouses. Others predicted growth in one-parent families, alimony arrears, runaway children, and child poverty. Predictions of this sort often rest on two related assumptions: that changes in policy have predictable effects regardless of location or context, and that we can reliably predict the future of complex social processes. Both assumptions are flawed. The lack of reliable data surrounding these predictions sits uncomfortably with the certainty of predictions made by the ‘No’ side during Ireland’s recent referendum. But what will happen after repeal? Evidence from past referendums gives some clues, but so does careful analysis of long-term patterns of social change. Processes such as later marriage, falling fertility, and secularisation, all play a role, and these are unlikely to change quickly, regardless of how the state regulates abortion. Some clue as to what may happen in post-repeal Ireland is found in Ireland’s divorce rate post-legalisation in 1996. By 2013, after initial increases in the immediate post-legalisation years, Ireland’s divorce rate had levelled off to an international low of 0.6 per 1,000, a rate below the EU average of 1.9. As with abortion, there are numerous factors underpinning this. Complex changes in family formation were already well underway before the legalisation of divorce. These included increasing births outside of marriage, falling marriage rates, increasing age at marriage, and rising cohabitation (see Figure 1). Since the 1970s, the introduction of a lone parent’s allowance, the legalisation of contraception, and waning church authority have together contributed to an increase in the proportion of births outside of marriage. With later marriages and a more liberal social climate came the possibility of separation, and demand for its legal recognition. As such, these processes were long in place prior to the divorce referendum, to the extent that continued legal restriction would have had little effect on underlying changes in family formation and dissolution. More generally, we can say that causes of change in social trends are extremely complex. The trends we see in a single measure such as divorce rates are a good example of this, as they are the product of multiple factors which work together to drive social change. The same applies to abortion, and the processes illustrated above are also relevant here. As with divorce, abortion was already a reality in Ireland long before repeal, as are underlying trends of falling birth rates, fertility, later childbirth age, and family planning. The introduction of legalised abortion to Ireland will arrive in this context – not as an immediate shock, but as an answer to its decades-long outsourcing to the UK. 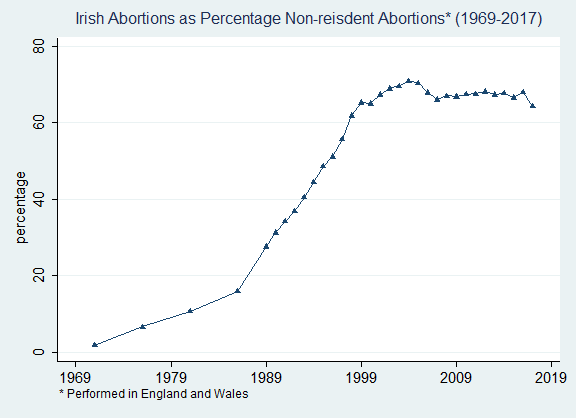 Historically, Irish residents have constituted the majority of non-resident seeking abortions in the UK since the 1960s. However, the increasing share of Irish women shown in Figure 2 mainly reflects changes in international abortion law. Of the 32,207 non-resident abortions in 1971, 11,986 of these were to French residents, 13,560 to German, and 578 to Irish. By 2001, of the 9,910 non-residents who procured abortions in the UK, 199 were French, 33 German, and 6,673 Irish. It is not that Ireland has seen unprecedented increase in demand for abortion services – although growth in the number of those procuring abortions has risen – but that Ireland has been left behind as countries across Europe liberalised previously restrictive abortion regimes. International evidence instead shows us that legal restrictions merely export the problem to more liberal regimes. Many look to the United States as a classic case study of the long-term effects of policy change on abortion and birth rates. Before the Supreme Court ruling on Roe v. Wade in 1973, abortion was only available in a select number of U.S. states. While the U.S. is different to Ireland in culture and politics, there were several similarities to women’s experiences in Ireland which make for a useful comparison. Like Ireland, many U.S. states heavily restricted abortion in the 1970s, and like Ireland, those who procured abortions often travelled large distances to states with abortion services. A 2013 study published in the Journal of Health Economics explored the consequences of Roe using a unique dataset on abortions performed in New York state from 1971-75. New York was a key destination for many in the pre-Roe era, being one of only six jurisdictions where abortion on demand was legal. Using data pre and post-Roe, they found that its effect on birth rates was less important than access to services in states such as New York. In other words, although availability of abortion mattered for birth rates, legal restrictions within states merely induced women to travel to those where abortion was available. This is similar to the circumstances of Irish women under the 8th amendment and suggests that the effect of legal restrictions on birth rates is minimal, where the option to travel is available. What will happen after repeal? If Ireland is indeed similar to pre-Roe America, then the effect of repeal will be modest. Abortion rates in the UK currently approximate 1 in 5 pregnancies, but this is a disputable figure, factoring only the sum of recorded pregnancies and abortions – there are many that are not recorded. Rates of abortion in the UK reached a peak of 17.86 per 1000 in 2007 but have remained stationary since the late 1990s. At present, we simply do not know – beyond an unacceptably large margin of error – what Ireland’s abortion rate is. Whether the rate equilibrates at 18 per 1000, or 1 in 5 (as predicted by the No campaign) does not matter however – what does matter is equality of access to safe termination. Given the class-biased nature of abortion at present, there will likely be an appreciable effect on birth rates if barriers to procurement are removed. This is not a ‘supply’ effect but reflects giving equality of access to those who would have sought terminations if cost was not an issue. 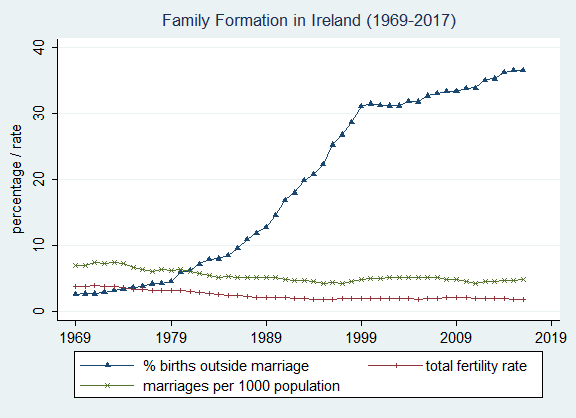 What is clear is that the circumstances which drive Ireland’s family patterns – marriage, divorce, or abortion – are not susceptible to short-term changes in social policy. Ireland has changed through processes which preceded the referendum by decades. It will continue to do so, and continued restrictions on abortion will do nothing to change this. Eoin Flaherty is a Lecturer in the School of Sociology at University College Dublin.